The Nexus 7 does well in many areas, but its lack of expandability limits its scope. 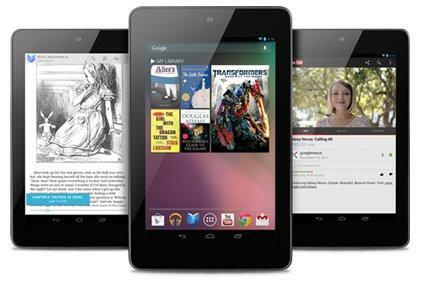 The Google Nexus 7 tablet resets expectations of what an inexpensive tablet can and should be. Starting at $199, the Nexus 7 clearly guns for Amazon's same-priced but lesser quality Kindle Fire, which runs Amazon's limited flavor of Android. Make no mistake: Of today's 7-inch Android tablets, the Nexus 7 is the one to beat, and it is handily one of the best-executed Android tablets of any size you can buy. In some ways, that's not saying much; for as much as it does well--it has a tremendous 10-plus hour battery life, and it produces reasonably clear text and accurate colors--the Nexus 7 stumbles by leaving out an expansion slot. You need to step up to the 16GB $249 version for the Nexus 7 to make a sensible purchase, and even then you'll be settling short of the ideal tablet you really want. The lack of a memory card slot hobbles Google's shiny new tablet before you can even get moved in and set up. Android has always held a big advantage over Apple's iOS in its ability to expand on-board storage via a memory card; in fact, this is something that every tablet competitor to the Nexus 7 but the Amazon Kindle Fire (and Apple's iPad, natch) has. The Kindle Fire has taken lots of flack for providing a baseline model with only 8GB of storage and no room to grow. It's not clear why Google opted to leave out the card slot. Cutting it may be as much about Google's live-in-the-cloud philosophy and services as it is Google and Nexus 7 manufacturer Asus trying to meet an aggressive price. If it is indeed Google's emphasis on cloud services that's behind this choice--and likely that's the case, given that Google bills the Nexus 7 as being "Made for Google Play,"-- that frankly makes Google's despotism no better than Apple's decision to keep users in its walled garden or Amazon's decision to force us to use its cloud services with Kindle Fire. Amazon, too, tried to spin its minimal on-board storage by saying you could store media in, and stream content from, its cloud services. That approach is not rooted in consumers' real-world usage patterns, and it doesn't account for the vagaries of Wi-Fi availability and bandwidth. Consumers crave off-line storage; we're still away from a wireless connection often enough that local storage matters. No one wants to have to keep managing their content on and off the tablet just to work around a space limitation. Given that we're seven months on from when Amazon's first-generation Kindle Fire was introduced, I'm surprised and disappointed that Google didn't push the default memory on Nexus 7 to 16GB in the $199 model. Now that would have gotten our collective attention, and rightly so. With Nexus 7 you're going to be downloading movies and television shows in high-definition, plus using apps optimized for high-definition displays and loading up your high-resolution images for use in the gallery, so 8GB just won't go very far. That amount of storage, with just 5.62GB of user accessible space when you first start the tablet--is just too parsimonious to make the Nexus 7 a truly solid recommendation. That's unfortunate, because the Nexus 7 actually gets a lot right--far more than most of its Android competition. When you pick up the Nexus 7, it's immediately apparent that it is not like other inexpensive tablets. Its construction has a high-quality look and feel; it doesn't have that inexpensive vibe you get from handling other "value" tablets in the market. The side bezel is plastic, with a textured, rubberized finish on the back that feels comfortable in-hand, and yet won't attract dust or particles as some rubberized backs we've seen (though it does seem to scratch fairly easily). Another thing you'll notice right away: this tablet is light enough that you can hold it in one hand for extended periods. At 0.75 pounds, the tablet is still about 0.2 pounds too heavy for no-thought-required one-handed operation, as you find with the dedicated E Ink-based e-readers that now weigh under half a pound. Still, the Nexus 7 is among the lightest tablets we've seen, and more notably, it's 18 percent lighter than Amazon's 0.91-pound Kindle Fire. The Samsung Galaxy Tab 2 weighs about the same, at 0.76 pounds, and the Toshiba Excite 7.7 weighs 0.77 pound (with its 0.7-inch larger display). The Nexus 7's footprint is about average. It's slightly thinner than the Kindle Fire (0.41 inch to 0.45 inch), and it's the same thickness as the Excite 7.7. The Nexus 7 is slightly longer than some of its competitors, too: it stands 7.8 inches tall, to Kindle Fire's 7.5 inches and the Samsung Galaxy Tab's 7.6 inches; the Excite is taller, though, at 8.1 inches. The Nexus 7 is also a smidge narrower than others, besting the Fire by 0.1-inch. I find the dimensions of the Nexus 7 convenient and pleasing; at 7-inches, this tablet was unobtrusive to use in cafes or on public transit, and its dimensions made it easy to thumb-type on the on-screen keyboard in portrait orientation. Still, in spite of what the numbers say, I prefer how the Excite 7.7's feels in my hands; it seems more balanced, thinner, and lighter than the Nexus 7, in spite of the specs saying otherwise. Other aspects of the physical design are noteworthy, too. The power/sleep and volume buttons along the curved right-hand bezel are sturdy and easy to press. Along the bottom bezel sits the headphone jack and a MicroUSB port, for charging the tablet as well as transferring data from your PC. Above the ports is an approximately two-inch wide stereo speakers port (both speakers outlet from the same single port, as on the Asus Transformer Infinity TF700). The speaker location along the bottom doesn't seem to adversely impact audio playback; it could get covered by your hands if you hold the tablet two-handed in horizontal mode, but not if if you hold it along the bottom edge, as opposed to the center. At the bottom left is a four-pin connector that Google says could be used for a dock, though no accessories appear to be available for the Nexus 7 at the time of this writing. Other hardware features include a 1.2-megapixel front-facing camera, and an NFC chip, which comes in handy for use with Android Beam if you happen to have another NFC-enabled Android device available. The front face is smooth scratch-resistant Corning glass (but not Corning's Gorilla Glass). The glass is optically bonded to the 7-inch, 1280 by 800 pixel display, and this makes a tremendous difference in the image quality. With no air gap in play, text looks crisper, contrast is better, and glare is mitigated (although not eliminated). At 216 pixels per inch, the Nexus 7 is clearly way ahead of other 7-inch tablets' pixel density of 170 ppi, and the difference is palpable. This is the third 7-inch tablet with a 1280 by 800 display. Oddly, Google appears to have tweaked the fonts in Android 4.1 and text rendering in the Chrome browser is very different than in the original Android Honeycomb (3.0) and Ice Cream Sandwich (4.0) browsers. The Nexus's tweaks lead to text that is visibly far superior to what we see on say, Galaxy Tab 2 or Amazon Kindle Fire, but is still sadly very jaggy and lacks the smoothness of "Retina" displays as on Apple's iPhone and iPad (which has 264 ppi), or even the smoother text rendering seen on Android 3.2 and Android 4.0 tablets. I'd have to say that Nexus 7's display bests that of Toshiba's Thrive 7 and T-Mobile's Springboard; both shipped last year with the same resolution display, but each had a noticeable air gap and produced poorer colors. I am impressed with how Nexus 7 handled the test images in our image quality tests. Color reproduction is pleasing and fairly accurate, although Android appears to still struggle with accurately reproducing skin tones. The Nexus 7 is the first tablet to use Nvidia's Kai reference platform. Kai was designed specifically to reduce the cost of producing a tablet without sacrificing performance. It would appear that the Nexus 7 achieves this goal, based on its performance on our tablet benchmarks. Inside, the Nexus 7 carries a 1.2GHz quad-core Nvidia Tegra 3 T30L processor; it runs at 1.3GHz in single-core operation. Those are the same frequencies as found on the new Acer Iconia Tab A700, but Nvidia can't comment on whether everything about the Tegra 3 inside the Nexus 7 is the same as on the A700. The tablet also has 1GB of DDR3 memory. The Nexus 7 lasted an astounding 10 hours, 10 minutes in our video playback test, with brightness set to 200 cd/m2 (candelas per square meter). That's just 36 minutes shy of the Apple iPad, and it tops all competing 7-inch tablets by a mile. Amazon's Kindle Fire lasted 6 hours, 54 minutes; Samsung's Galaxy Tab 2 7.0 lasted 6 hours, 20 minutes; the Toshiba Excite 7.7 lasted 7 hours, 32 minutes; and the Sprint ZTE Optik lasted 5 hours, 51 minutes. That figure is also competitive with 10.1-inch Android tablets; Acer's Iconia Tab A700 lasted 8 hours, 11 minutes; Toshiba's Excite 10 lasted 7 hours, 5 minutes; the Samsung Galaxy Tab 2 10.1 lasted 11 hours, 41 minutes; and the Asus Transformer Pad Infinity lasted 7 hours, 58 minutes. Unfortunately, the Nexus 7 also took the longest of any 7-inch class tablets to recharge, requiring 3 hours, 49 minutes to fully juice up, compared with the Galaxy Tab 2's 3 hours, 32 minutes and the Toshiba Excite 7.7's 3 hours, 21 minutes. This result might reflect the fact that the Nexus 7 charges via its MicroUSB port. The Nexus 7 excelled on our benchmarks. It was the best performer of any of our 7-inch class tablets; and was competitive on some tests with the top 10.1-inch Android tablets. Its performance on Geekbench, for example, was nearly four times better than that of the Galaxy Tab 2 7.0; and it bested Toshiba's Excite 7.7, too. Interestingly, though it was close to the Acer Iconia Tab A700 on this test, it outperformed the Acer on some of our metrics and fared worse on others. Both tablets run an Nvidia Tegra 3 at the same clock speed, so these variances could be due to tweaks in the Tegra 3 chip or other unknown variables. On our two GLBenchmark 2.1.4 tests, the Nexus 7 was an average performer. It logged the sixth-highest score we've seen on Egypt Offscreen, at 63 frames per second; by comparison, Asus Transformer Pad Infinity logged 74 fps, and iPad logged 139 fps. On the Pro Offscreen test, the Nexus 7 was fifth highest, at 82 fps, as compared with 96 fps for the Infinity and 139 fps for the iPad. For perspective, the Kindle Fire lagged far behind, scoring just 23 fps and 31 fps, respectively, on Egypt Offscreen and Pro Offscreen. The Nexus 7's performance on our Web browser-based tests was mixed. It was the fastest performer of our field on Sunspider, requiring just 1.71 seconds to complete that benchmark; but it was among the slower performers on a custom, media-heavy Web page load test. In use, I found the Nexus 7 fast and responsive. I especially liked the dramatically improved keyboard, which seemed better able to keep up with my flying fingers. The Nexus 7 is the first tablet with Android 4.1 Jelly Bean, and the differences between Ice Cream Sandwich and Jelly Bean on tablets are a lot greater than Google first let on. For my comparisons with ICS tablets below, I used Samsung's Galaxy Tab 2 (which also has a custom overlay), Asus's Transformer Pad Infinity TF700, Acer's Iconia Tab A700, and Toshiba's Excite tablets (7.7, 10, and 13). The changes are evident as soon as you start up the tablet and see the Welcome screen. The new Android 4.1 Welcome screen and its ensuing setup walkthrough and first-time-use pop-up explanations are incredibly friendly for newcomers, with big, bold lettering and a clean design. That clean design continues with the Android 4.1 home screen, which reflects numerous changes to the Android experience on a 7-inch tablet. For one thing, Google has refreshed the home screen with changes both minor and dramatic. A nifty Google launcher runs along the bottom, with five basic Google app icons--for Play Books, Play Magazines, Play Movies & TV, Play Music, and the Play Store--and a folder packed with 11 other native Google apps, including the Chrome Web browser which now replaces the previous "Browser" app. At the center of this launcher bar is the new menu icon, which is the only one of the seven icons that's fixed; you can swap out the others for other apps of your choice, or for folders of apps you choose. Google has shaken up the design of its core navigation and status buttons, in order to reorient everything around the portrait position. Google expects 7-inch tablets to be used more in portrait mode than anything else. This explains the move of the three nav buttons (back, home, and recent apps) from their former location flush left to their new locale, spread out along the bottom center of the display. The clock and notifications, meanwhile, move from the lower right of the display to the top of the screen. To gain access to the notifications or settings, you must slide down the "shader" from the top of the display. After the clean simplicity of the notifications pop-up on the lower right of the screen, this new design is hard to get used to. Pulling down the shader reveals a larger clock, a rotation lock soft-touch button, and a settings shortcut. Though cleaner than the pull-down Google provided on the early Froyo-based Galaxy Tab, the effect is the same: It makes the Nexus 7 feel more like a phone than a tablet. Other interface tweaks contribute to making the Nexus 7 feel more like a giant phone than a tablet. The home and menu screens are fixed in portrait orientation, which can be jarring if you're moving from watching a video to doing something else on the tablet. And in the settings menu, you no longer have panes in portrait mode; this change makes it faster to navigate among settings options. Also gone is the battery life percentage; you get just an icon now. Many of these tweaks annoyed me greatly, since I was accustomed to the features offered on Android 3.x/Android 4.0 tablets; they made it more difficult to reach some features, and I prefer the simplicity of a tap versus a pull-down shader for accessing more menu options. Google says that the former layout should be what we see on future 10.1-inch Android 4.1 tablets, but I missed that design on the 7-inch size. I did like the new set of Play widgets for surfacing content from My Library, My Books, My Magazines, My Movies, and My Music, but I was less satisfied with the recommendations widgets. The beauty of Android is that you have the choice to customize the home screen, and you get customization in spades. Widgets are more resizable now; and in addition to the Google Play widgets, you get a handy new widget for quick access to wireless, rotation, and brightness controls--plus another one for using Android 4.1's new music identifier. The music ID worked successfully with most of the music I threw at it, struggling only with beat-heavy areas of dance tracks and some obscure world music choices from Croatia, Japan, and Poland. At the top of the home screen sits the Google Now bar, with a handy introduction to the Google Now search services, and a microphone icon for initiating voice searches. One more change for the better: The Google Nexus 7's native image gallery has improved image rendering as compared with Android 4.0 and 3.2. I noticed that images regained full sharpness more quickly than before, a critical feature when you actively use the gallery to show off your pictures. Unfortunately, Nexus 7 also shows one of Android uglier sides--the pain of OS and device fragmentation. I encountered some tablet apps that wouldn't work on the Nexus, raising the old issues involving Android's app availability and compatibility. Android 4.1 goes a long way toward improving Android's usability--in spite of the aforementioned portrait mode and nav button mess--but it doesn't solve some of the underlying problems, either. The Google Nexus 7 tablet is simply the best 7-inch tablet you can buy today. It performs well, but its mixed display performance and lack of a MicroSD card slot prevent it from eliciting unequivocal enthusiasm. Ultimately, the 8GB Nexus 7 is the best tablet you shouldn't buy today; although, that said, its relatively low price will soften the blow when you outgrow the Nexus 7's limitations and want to step up to another model in six months' time. At 16GB, the Nexus 7 becomes an affordably priced starter tablet that provides terrific battery life, solid performance, and the latest full-court version of Android. But beware of the storage limitations; they might be a deal breaker for anyone with a large media collection or a desire to download movies and TV shows from Google Play.